CT225 Compact Tractor, Front Loader and 3 point Auger with 9” Bit – This is a hydrostatic 27 HP diesel compact tractor with a 7TL front loader. The bucket on the loader measures 68” and has a 1098 lb capacity. The tractor has 2 or 4 wheel drive, cruise control, turn signals, hazard / head lights, ROPS protection system. 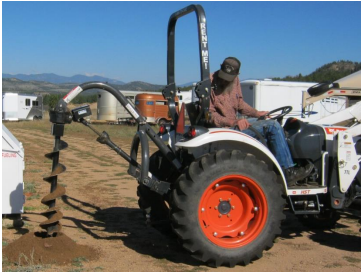 The rear 3 point auger has a 9” bit on it and is capable of going thru thick soil to difficult clay. Rock can be extremely difficult to penetrate with a rear auger. Consult us for details…….